Should you be planning to visit the Franconia Brewing Company during the first Saturday in February, you need not worry if you forget your jacket at home. Sure, there's a chance it might be cold out, but one sip of the brewery's 2015 Ice Bock might be all you need to keep you warm for hours to come. It was one year ago when owner Dennis Wehrmann decided to take advantage some particularly cold temperatures here in the Metroplex to try his hand at creating an eisbock. For those that don't know, making an eisbock (or ice bock) involves exposing a beer to freezing temperatures long enough for the water inside it to crystallize. Once it does, you remove the ice and are left with a beer that's more concentrated in terms of both flavor and alcohol. The 2014 edition of Ice Bock was based on Winter Wheat (a weizenbock), but this year Wehrmann and head brewer Cam Horn chose to start with their Tripple Dunkle instead (meaning this vintage is not actually a "bock"). Noting that Tripple Dunkle has a higher ABV to begin with (over 10% vs. 7% for Winter Wheat), the question then becomes whether or not the finished product has a chance to be the strongest beer ever produced in Texas. The jury is still out on that point, but samples have been sent to the Siebel Institute in order to find out. As for how it tastes, after sampling a pre-release sample of 2015 Ice Bock, let me just say...in a word...lordy! Is there such a thing as beer Everclear? If not, maybe now there should be. Grain alcohol fills the aroma of this beer, as does a more intense impression of the chocolate and roasted malt flavors that make up Tripple Dunkle. The beer is rich, raw, a little bit gritty and warm...really warm. That may sound daunting, but I assure you your senses will adjust. The alcohol maintains a strong presence throughout the experience, but the beer becomes more drinkable with each and every sip. And, did I mention it was warm? Ice Bock will be released Saturday, February 7 at 11 a.m., during Franconia's regular tour. Just over twenty gallons will be available, tapped from one of the brewery's 200 year old kegs. 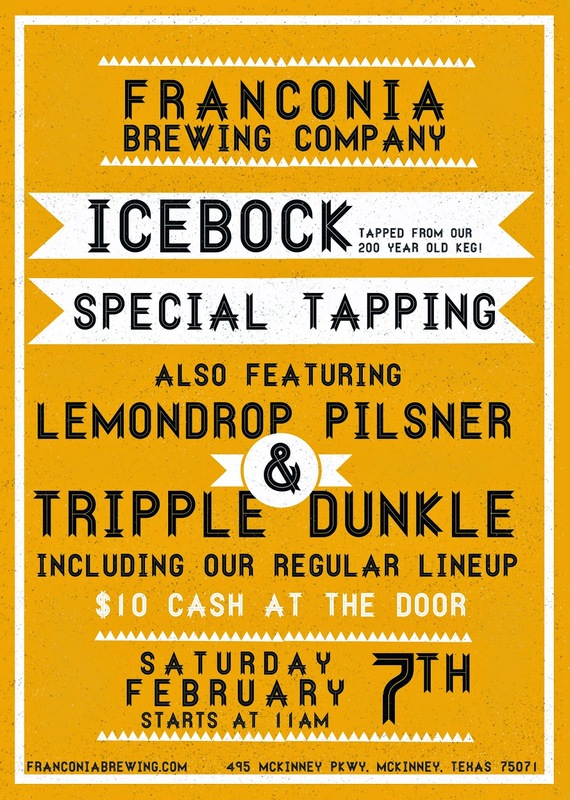 Also on the bill for that day is the new Lemondrop Pilsner. Brewed with German pilsner malt and Lemondrop hops (a variety bred partially from Cascade), it's a refreshing single malt, single hop beer with notes of melon, tea, lemongrass and a hint of finishing citrus. It'll be a day of something light and something dark, but note that while you'll be able to get full pours of Lemondrop Pilsner, sample sizes of Ice Bock will be much smaller due to that beer's strength. An ounce or two of Ice Bock should be more than enough, though, since I'm here to tell you...a little goes a long way.